4. Select your language (you can choose only the languages available for translation) and "Add to Shopping Cart". 5. Once you're ready (have selected all the seminars) go to your shopping cart. You will see it as an icon on the upper right side of the page. 5. Follow the steps, place your information as you would in a general online store. Once you register your will receive a confirmation e-mail with all the seminar details. Please make sure to read it carefully and completely. If you already resister and haven't receive a confirmation e-mail please check your Spam folder and if it's not there contact us at info@viannainspain.com as soon as possible. You will receive another e-mail with the information on how to make payment 2 to THInK receive a couple of working days after your registration has been successfully completed. The second payment (payment 2) covers the cost of the seminars. It is made in American Dollars and it's paid directly to THInK. Once you complete your confirmation payment your assistance to the seminars is confirmed. You will receive an e-mail with a link to pay THInK's Fee thru PayPal or Bank Transfer. This means you have to complete payment 1 (LiveTheta) and payment 2 (THInK) in full. THInK is offering a subscription for a payment plan without additional rates to complete the second payment for the seminars. If you register before December 30th you can pay THInK's fee (payment 2) in 3 month installments. 1st month payment to THInK has to be completed before December 30th. To register you must complete the "Registration" by paying the Coordination fee (payment 1), you'll find the details of the investment below. PayPal. Create an account at the website paypal.com and make all your payments with ease, comfort and security. If you have doubts on how it works visit their website or send us an e-mail to info@viannainspain.com and we would gladly help you. It is the fastest and more secure way to register and make your payments to THInK. Don't forget to make the transaction 10 working days prior to the beginning of class! For THInK's fee you can also choose Bank transfer when paying in full the corresponding fee. Your Coordination Fee covers all the coordination costs, saves you a place in class and guarantees your materials. This is prior to the beginning of the seminars, therefore the payment is non refundable. Regarding refunds of the class payment you must present your particular case to THInK Headquarters. However refunds are rarely given and must not be counted on. Its important that you fill in your electronic contracts before the beginning of the seminars. This contract is your trademark license agreement. We will send you an email few days before each class so you can fill the electronic contracts needed for each seminar. If it is the first time you fill them in, its very simple. Just click on the link we send you, and follow the online instructions. Use your email that you are using in your ThetaHealing profile. It is better you fill them with time before the seminars. If we cannot verify you have done them beforehand, we will ask you to fill them again before the start of the seminar. You will have to fill all the contracts before entering the conference room on the first day of class. In the hospitality desk in the lobby of the hotel Las Arenas Balneario we start a Pre registration so you can complete any payments for THInK and pick up your class materials. We recommend you to complete your payments prior to this day. The payments will be collected by PayPal or credit car using the official ThetaHealing site. If your payments are completed beforehand you can just come and enjoy your certification. During Pre registration you can still register for the classes as long as there are seats left in the room which we cannot guarantee. It is last moment we accept payments to THInK. 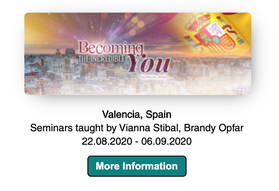 If you cannot make it to the Pre-registration day, please write an email to info@viannainspain.com so we can schedule a time before the beginning of the seminar for you to complete the payment. Coordination Payments can only be made with PayPal & Bank Transfer. Basic DNA Instructor March 31st 7:00 to 8:40hrs. Advanced DNA Instructor April 05 7:30 to 8:40hrs. Dig Deeper Instructors April 08 7:00 to 8:40hrs. You and Your Significant Other Instructor April 11 7:00 to 8:40hrs. GYR 2: You and the Creator Instructor April 14 7:30 to 8:40hrs. GYR 3: You and Your Inner Circle Practitioner April 17 7:00 to 8:40hrs. GYR 4: You and The Earth Practitioner April 19 7:30 to 8:40hrs. GYR 3: You and Your Inner Circle Instructor April 23 7:00 to 8:40hrs. GYR 4: You and The Earth Instructor April 25 7:30 to 8:40hrs. We highly recommend going to the Pre-Registration. This allows you to arrive at 8:30 hrs. the first day of every class. REMEMBER to bring with you a print or electronic copy of your payments. You should wear your NameTag at all times during class. It is necessary to pick it up at the beginning of class every day and give it back at the end. This prevents losses and verifies that you arrive on time and that you do not leave class before it's finish. Only attending class every day during the entire schedule you can receive your certification. All the clases are given in English. The translation to Spanish is consecutive and does not interfere with the English on the main speakers. For the languages on demand we need at least 10 people interested in the language that are ready to register before February 15th, 2019. Please send us an email to info@viannainspain.com to place you on the waiting list and we will contact you when and if the language is confirmed. On the new site www.thetahealinginstructors.com you can find other places where the Instructor Seminars are given in other languages we are not offering in Spain. The name that will appear in your Instructor's Certificate is the name that appears in your practitioner's profile. Take a moment to verify it. If you wish it to appear differently you must change your profile information no later than March 30th. We cannot make any changes to your profile or your name for you. To enter your profile go to www.thetahealing.com and fill out your information next to the "LOGIN" bottom. If you do not remember your password click "Forgot login information?" (under the "Password" box) and follow the steps. If you do not remember your username send an email to customerservice@thetahealing.com Don't forget to use the word ThetaHealing at the subject line so they can receive your email at THInK. On the email body you can write "Forgot username and password for (your name)". Classes start 9:00 hrs. SHARP and finish at 17:00 hrs. We recommend you to arrive 30 minutes prior to the start of a class. PUNCTUALITY IS VERY IMPORTANT. Each student is responsable for being on time at the start of class and at the end of the coffee and lunch breaks. TO RECEIVE YOUR CERTIFICATION YOU MUST ATTEND EVERY DAY OF CLASS DURING THE WHOLE SCHEDULE WITHOUT EXCEPTION . Plan your stay accordingly! The doors to the seminar room open at 8:30 hrs. You are not allowed to enter before this time. The doors close at 17:30 hrs. You are not allowed to stay after this time. It is forbidden to leave any kind of possession behind or to reserve seats. 1 Practitioner's manual and 1 Instructor's manual. You will receive your manuals in the language in which you register. If you wish your manuals in another language but do not need the translation to this language please, once you have completed your registration payment, send us an email to info@viannainspain.com no later than February 15th to request for your manuals in your desire language. You will receive your material (only 1 set) in the desire language only if it's in existence, if the language you wish for has no current translation we will give you an adequate alternative. Once we confirm with you the language of your manuals you will not be allowed to change them to another language at the Registration of the class. There will be a complementary Coffee Break at 11:00 hrs. included in the seminar. At 13:30 hrs. there will be one hour Lunch Break. The cost of lunch is not included in the seminar price and each student is responsable of their meals. UNDER ANY CIRCUMSTANCE YOU MAY LEAVE BEFORE THE END OF CLASS THE LAST DAY OF EACH CLASS. TO RECEIVE YOUR CERTIFICATE YOU MUST BE PRESENT AT GRADUATION WHICH WILL TAKE PLACE AT 17:00 HRS. The cost of your stay is not included in the seminars. The Balneario Las Arenas Hotel offers a special rate for the event. Enter their website and when you look for rates and availability enter the Promo: "THETA18" and you will find special offers. In Valencia you can find many diferente lodging options. Visit our venue section to find more information. We will be very happy to see you in Spain and join you in this very important step in your career as a ThetaHealing Instructor! If you still have any doubts or questions about the Teachers Certification in Spain (hours, costs, venue, etc.) please contact us sending an email to info@viannainspain.com, thank you. Be part of this wonderful experience. Let's live a life with purpose with ThetaHealing!